Pre-heat the oven to its highest setting. Make the pizza base according to packet instructions and leave to rest for five minutes. Meanwhile, put the butternut squash onto a roasting tray, drizzle with Filippo Berio Olive Oil and cook for 10 minutes. Remove and set aside. Roll out the dough to a large rectangle. Spread over the Filippo Berio Tomato & Ricotta Pesto, scatter over the mozzarella cheese, Parma ham, cooked squash and sage leaves. Season to taste with salt and freshly ground black pepper. Sprinkle over the Parmesan cheese and place in the oven for 10 minutes or until cooked. Drizzle with chili oil and serve immediately. Tip to make your chili oil, mix together 2 tsp of Filippo Berio Hot Chilli Pesto and 4 tbsp Filippo Berio Extra Virgin Olive Oil. Homemade pizzas are great fun to make and taste delicious. 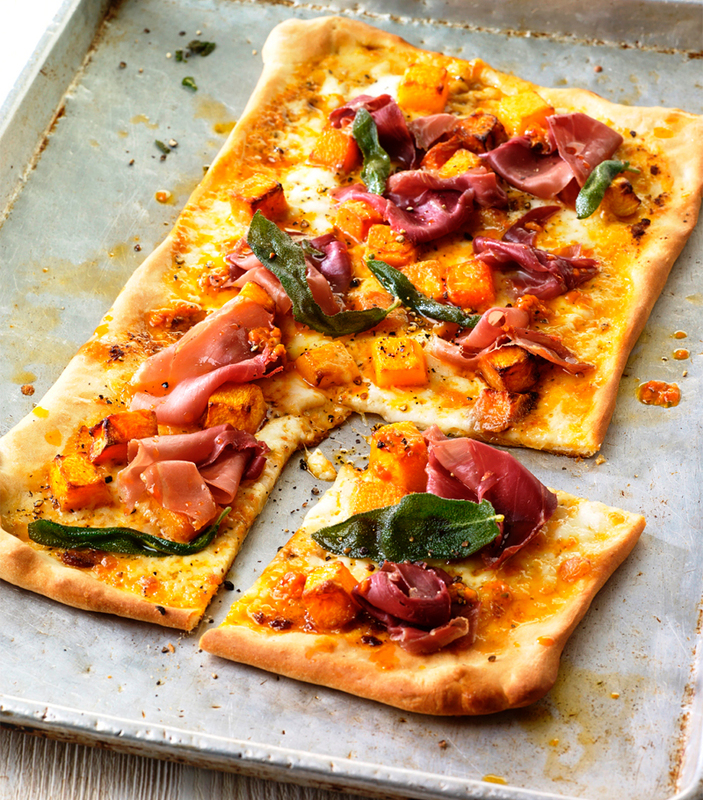 The sweet, earthy flavours of butternut squash, sage and Parma ham in this recipe make for a winning combination.